The power cable is with a 15 amps fuse, and there is a backup fuse in the package. 1. Make sure the power switch is at OFF position and the vehicle engine is running. 2. Remove the dust cap from the tire valve, and then attach the air chuck to the tire valve stem, and screw onto tire's valve stem. 3. Plug the power cord into a 12V cigarette lighter socket. 4. Press (M) button to choose the display unit. (4 units available: PSI, KPA, BAR, KG/CM). Press (-) or (+) button to set the desired pressure, and then wait until it stops flashing. 5. Turn on the power switch. 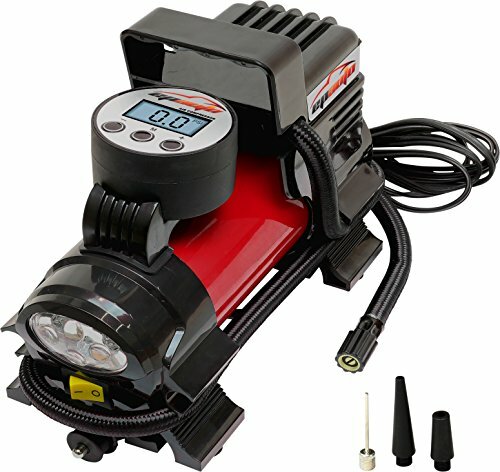 The compressor will automatically stop inflating once the desired pressure is reached. 6. When the desired pressure is reached, turn OFF the power. 7. Unscrew the valve connector, place the tire valve dust cap back to the tire & disconnect the power cord from a 12V cigarette lighter socket. ☛ MULTIPLE USES: Inflate tires on cars, bikes, sedan and midsize SUV. DOES NOT SUPPORT LT, HT and Truck Tires. Adaptors for balls and inflatables included. ☛ PREVENT OVER INFLATION: Auto shut off when reaching the desired tire pressure. Overheat protection shuts off automatically when overloading.